Chemical engineers at EPFL have demonstrated for the first time that an atom-thick graphene membrane can separate gas mixtures with a high-efficiency. The "ultimate" membrane is scalable, making it a breakthrough for industrial gas separation. Separating mixed gases, such as air, into their individual components is a process with multiple industrial applications, including biogas production, air enrichment in metal working, removal of toxic gases from natural gas, and hydrogen recovery from ammonia plants and oil refineries. Gas separation usually takes place with the use of synthetic membranes made from polymers (e.g. cellulose) or other materials. In recent years, research has turned to what many refer to as the "ultimate" membrane: a layer of graphene, a single atom in thickness, which has been now shown to be the thinnest molecular barrier and hence the most efficient membrane, offering excellent permeance combined with robustness and scalability. However, progress with developing graphene has met with two "bottlenecks": First, a lack of methods for incorporating molecular-sized pores into the layer of graphene, and second, a lack of methods for actually manufacturing mechanically robust, crack- and tear-free, large-area membranes. Now, in a breakthrough that solves both problems, the team of Kumar Varoon Agrawal at EPFL Valais Wallis has developed a large-area, single-layer graphene membrane that can separate hydrogen from methane with a high-efficiency (separation factor up to 25), and an unprecedented hydrogen permeance from a porosity that was only 0.025%. The membrane contains nanopores to allow hydrogen to permeate through, for what is known as "gas-sieving". The membrane was stable at industrial pressures and temperatures (at least up to 7 bar and 250 ºC). But more importantly, the team was able to produce a surface are of 1 square millimeter – significantly larger than previous reports, where only a few square micrometers could be synthesized without cracks. 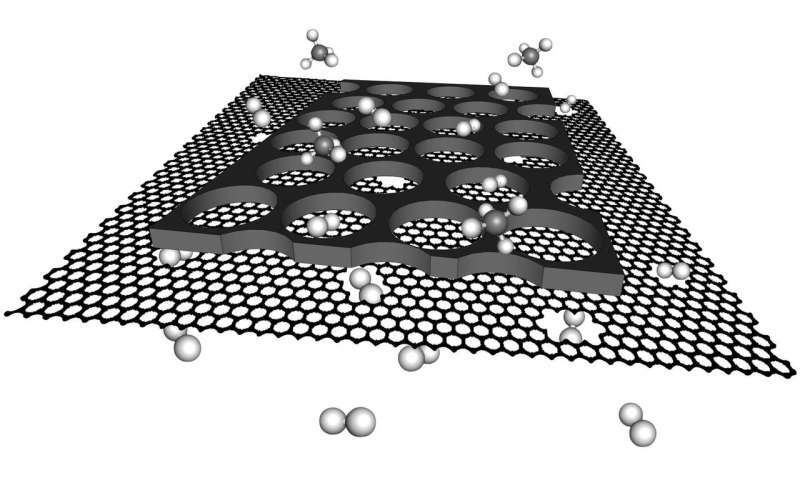 Agrawal's group is now working to incorporate higher density of nanopores in graphene, to make graphene realize its true potential. "The novel technique to produce crack-free graphene layer will go a long-way in realizing the ultimate performance of the atom-thick graphene membranes for a number of important chemical separations including carbon capture, hydrogen recovery and the purification of clean drinking water," says Agrawal.